“Forgive me, Father, for I have sinned! It’s been a while since my last confession.” This sentence is the prologue to many a surprising new development in movies and novels. 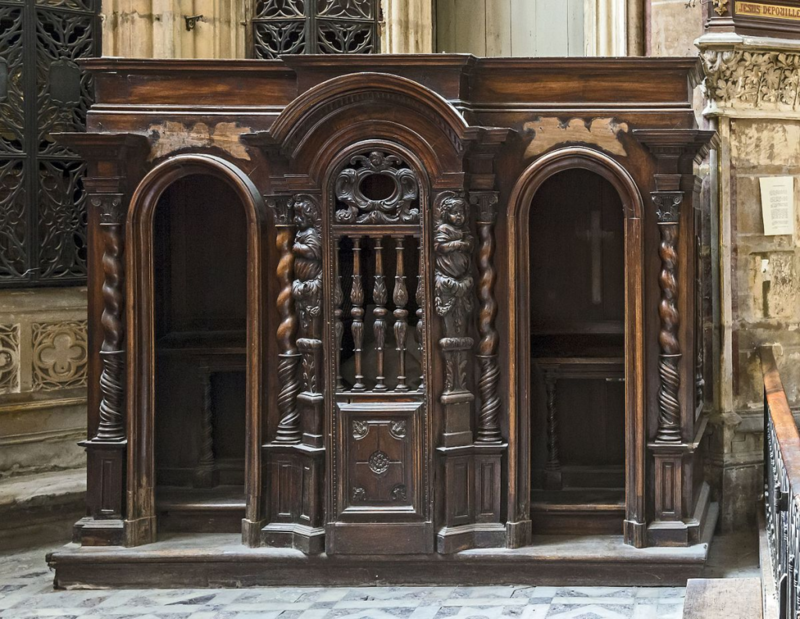 Through listening in on the confession, all of a sudden it is revealed to us what the character in the confessional really is like and really did. As the story normally goes, there is now a time and place for a new direction. In these movies and stories most of the time it takes a crisis of sorts to trigger the sinner to seek confession and forgiveness; it normally doesn’t come easy. It is about 30 years ago that I sold the first startup to a larger company and ended up in the games of fairly large corporations. It is about 20 years since I left the US again after launching a small subsidiary of a Danish company and trying to have corporate America as customers. This was in the middle of the first .com bubble, before it burst and attitudes and convictions in business were very different then. It is exactly 10 years ago I was approved as a Certified Scrum Trainer under the Scrum Alliance. It is about 1 year ago that we launched the Agile Lean Leadership initiative to help scale Agile, Lean and Scrum out in the whole organization. On top of these events there have been personal triggers, the details of which I shall spare my readers of. Being naive used to mean “natural or innocent”, and did not convey the images of ineptitude or lack of thinking capability that we typically associate the term with today. I obviously right now like the former definition best. Nevertheless I have to admit to being naive in this particular respect. I really believed that when people in organizations saw the possibilities of improvement and increase in outcome that Agile and Lean patterns and mindsets provide, then they would rally behind such changes. If only we could explain and document things well enough, then the vast majority would be behind a reform. But people don’t change by being told, they have to be shown. For most people it is very hard to go from a concept presented to an implementation; they have to see something that reflects or resembles their own situation pretty closely before the change can become attractive. Another thing at work here is our extreme conservatism when it comes to changing. At least in our part of the world where most people are quite comfortable, the prospect of risking something in a change is really unattractive. Well, this comes with a twist. The people who do the actual work of producing value for customers, normally jump on board introducing Agile or Scrum quickly. They experience that they are being shown the value, it is close enough to their every day life to see the potential value. They see the potential of seeing the value of their work, to have a certain satisfying autonomy and to attain mastery in their area of skill – these are all the things that build up intrinsic motivation in an individual. Those above, typically placed in a traditional hierarchy, are often dragging their feet or outright sabotaging changes. Since they have been lifted out of the real work, they don’t easily experience the proposed benefits, what about their jobs? How are they going to change? It sounds risky. Since we humans react way stronger to a probability of a loss than that of a gain, resisting seems the best bet. This is where I have been naive. I thought that managers in a hierarchy would adapt and figure out a way for the benefit of the organization. But no, the hierarchy is that stabilizing backbone of many larger organizations. It prevents change very effectively as it is optimized for compliance and predictability. Sometimes people in hierarchies are completely transformed into bureaucrats who only have the power to say “no” but not “yes”, a “yes” would require them to go up step on the ladder or taking a risk. The safe bet is to do nothing and say “no”. If we attempt an agile transformation in an organization with a hierarchy, top management has to be involved and be the sponsor of the model and working conditions that seem attractive to those in the hierarchy. Like all other people, they need a fulfillment in their work; the transformation must contain roles and responsibilities for these people to subscribe to and opt in for. This has often not been done. Perhaps linked with the previous point, I have to admit to believing too strongly that human beings will make rational and well-considered decisions; that if presented with the right information people will figure it out and reach good fact-based decisions. But no, they frequently will not. There are two parts to this obstacle. The fallacy of the sunken cost. When we have invested in something we are prone to keep doing so beyond reason in order to avoid facing up to a failure. This is also called loss aversion. Attribute substitution. When faced with a difficult question our lazy brain quickly substitute this with an easier one, which we can answer, but still believing we answered the difficult one. “What you see is all there is”. We tend to believe that what we have seen, is all there is to see about a subject. This is of course grossly inflating our own capability, but we do it nevertheless. Hindsight bias is the inclination, after an event has occurred, to reconstruct our story of it so that it appears to have been predictable, despite the fact that before the event there was precious little knowledge supporting such a view. Our lazy brain interprets the world much more ordered than it really is. We see causal connections where only correlation exists. 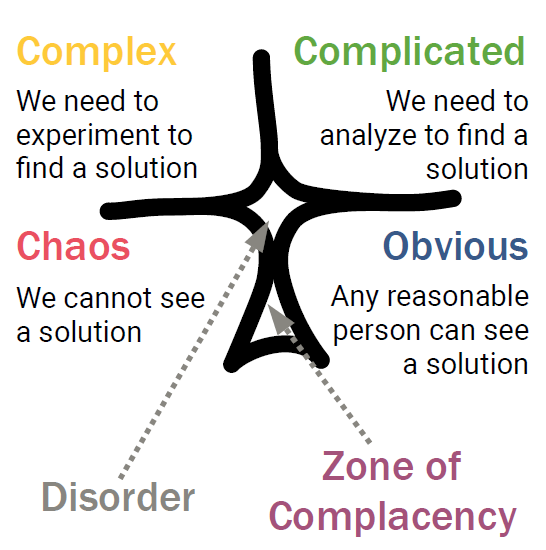 We are in the Complex domain, but believe it is ordered, Complicated perhaps. Only when facing real crisis, realizing imminent chaos are we prepared to review our theories from the Obvious or Complicated domains. That should have been realized and done much earlier. We like rules and easy theories, but we fail to take uncertainty into account, sometimes with really bad decisions as a result. In the future I will try to focus on very critical review of solutions and business plans in teams, using workgroup methods to challenge our brain’s easy shortcuts to the best of our abilities. I didn’t deliberately set people up for disappointment, but quite a lot ended up disappointed after a while. I have been busy showing people the prospects of a better way of working and accomplishing results, but didn’t place enough effort in preparing them for resistance to be expected. Another variation of this is that an agile approach actually does solve a specific challenge, but when the crisis is over, the hierarchy moves back to the old ways. In hindsight it can all be explained, it was not all that necessary. A large Danish bank is currently introducing Scrum for the third time. They did it in 2001 when they urgently needed to get out on the Internet and after succeeding OK, they went back to the old model. The financial crisis in 2007-08 triggered a similar chain of events, and now another kind of crisis has started the third attempt. During the second World War II W. Edwards Deming and other introduced teamwork and production methods similar to Lean with enormous success, when the war – the crisis – was over old management moved back and everything reverted, “By 1950, the US had forgotten everything”, says Dr. Deming. We need to remind people of the dynamics of change, where we are battling several aspects of our human nature, including the difficulty of adopting the view that leadership is a service, when all experiences seem to indicate that it is a privilege. Following from the last point, I realize that I often have been so busy painting the picture of the stable state of an agile organization that I failed in giving the students ample driving directions towards it. Like telling the nineteenth century settlers of California about the beauty and bountifulness of the country without teaching them how to cross the salt and sand deserts of Nevada and the Donner Pass of the Sierra Nevada mountains. We have to teach people how to overcome the impediments on the way. There is unexpected work that needs to be catered for, how do we do that without ruining the Scrum pattern for example? There is the occasional difficult person, who wants nothing but his own way. In addition there will always be an impatience for quick results and rapid fixes. Finally to repeat what Daniel Kahnemann said in an interview as an old man, when asked what his main wish for mankind was, after he had spent a lifetime demonstrating how flaky our decision- and policy making really is. His answer was “I wish I could teach mankind to be a little less overconfident”. That is going to be my last confession, having been too overconfident about my solution, remembering that although I think I have seen it all, and understand an organization’s need, there is more to observe and make sense of. Nobody understands a man until you walked a day in his shoes. An organization has to find its own compass and plot its own course, it cannot copy a hero organization or just follow a clever consultant’s path. It is their destiny, they must take responsibility; but we should supply them with all the materials, patterns, maps, tools and experiences we have, and then out of respect let them decide the course. The journey of being a Scrum Trainer through the last 10 years has been an unmitigated pleasure filled with challenges, learning and meeting enthusiastic and talented people around the globe. It stands in sharp contrast to the two previous decades, where we were developing, selling and supporting large IT systems to the media industry, from hairy-assed English printers to certified manio-depressive ad-agency bosses to the dark corners of American media companies. They gave us Hell. One media company prided itself of having driven 6 suppliers into bankruptcy. During a consultancy gig at the Los Angeles Times, some staff members revealed that the internal nickname for the paper was: “The Daily Miracle”, as no one understood how they managed to appear in print every day in this totally dysfunctional organization – they still manage that by the way. The several thousand people I have had through the Scrum courses have exhibited a disproportionate level of interest, concentration and engagement compared to other areas where I have acted in a teaching capacity. I want to thank them all for that. Many a time have I come away from courses lifted up and thankful for what I learned. Sometimes I thought maybe I got more than I managed to give them. There have even been radical voices that have suggested that I then pay them their money back, but I never went there. My regret or confession is, as will have transpired above, that I may have raised their expectations beyond a reasonable level, made them believe that the journey would be easier, with more tailwind than is really warranted in reality. That to achieve the benefits of the Agile and Lean way of working – in any significant measure – will require disciplined commitment from the teams involved over a considerable period of time. That staying alert in the complex domain, constantly making sense of the world – of which we only possess fragmented knowledge – is hard mental work. It is much easier for our lazy brain to drift back to assume that the world is orderly and predictable, that we are in the Obvious domain. It really is a comforting self-deception. That you bind people together with real common goals and values in the complex domain, not rules and regulations. If you want people’s participation in knowledge work, treat them as volunteers. That you have to choose between implementing Agile, Lean and Scrum either under the radar or as a beginning of a journey for the whole organization. If you want the latter make sure top management is behind you on it, that you have at least one sponsor in high places for your initiative. If not the traditional hierarchy will squeeze the living daylights out of an agile initiative at the first or (at the very latest) the second crisis. That all good initiatives of transformation require a trigger. Something that is accepted fairly widely as a due cause. This should be put up on the wall and looked to whenever doubts about the sanity of the transformation in process is questioned. That if you fly under the radar, or treat the Agile initiative as Chernobyl, and cover it in lead and concrete to protect the rest of the organization from this dangerous agile radiation, then be satisfied with that. Focus on this island of the organization, make that a great place to work, to create value for your customers. Don’t worry about the rest. There are things you can change and things you can’t, let it go!